Powers/Abilities: Demonicus does not actually have any superhuman powers, typically preferring to empower and/or equip others to battle for him. He is of genius intellect with advanced knowledge of genetics (though less so than the likes of the High Evolutionary, Arnim Zola, etc.). He is also experienced with the advanced technology of the alien Myndai. The remainder of his abilities are normal, and he has minimal fighting skills, though he has sometimes fought like a madman, enabling him to hold his own against a seasoned combatant such as Gabe Jones. Demonicus suffers from skin cancer, inhibited by his own technology. Demonicus typically employs genetically mutated humans or animals, often subject to cyborg implants or radiation from the Lifestone, which serve as his primary fighting force. Demonicus' greatest possession was the Lifestone, a radioactive meteorite, with which he created a number of artificially mutated monsters. Most of the Lifestone has since been destroyed, leaving only small fragments of it intact. Demonicus holds the largest known surviving fragment. Demonicus wears lightweight armor over synthetic stretch fabric, containing devices to inhibit the effects of his skin cancer. He carries a hand-held blaster that fires an unknown form of concussive energy. He has used armies of men armed with blasters, conventional weaponry, various airships, etc. He also has used a menta-probe, implanted on the foreheads of others to force them to do his bidding without question. (Official Handbook of Marvel Universe Deluxe Edition#3: Dr. Demonicus) - Dr. Douglas Birely worked at a private research company in California. (Official Handbook of Marvel Universe Deluxe Edition#3: Dr. Demonicus) - Reading of the growing number of human beings who had gained superhuman abilities through the exposure to radiation, Birely asked his employer for permission to subject himself to the radiation they were using in their tests on animals, and was refused. Undaunted, Birely staged a laboratory accident during which he was exposed to the radiation. To his chagrin, he did not acquire superhuman powers, but instead contracted skin cancer. (Godzilla#5 (fb) - BTS) - Birely was driven mad by the experience, and he refused to comply when his employers tried to get him treatment. (Official Handbook of Marvel Universe Deluxe Edition#3: Dr. Demonicus) - An official investigation of the incident revealed Birely's sabotage and he was fired from the company. (Godzilla#5 (fb) - BTS) - Birely saw a report of a large meteorite crashing in the Aleutian Islands. Hoping that it would possess unknown properties of cosmic radiation, Birely decided to search for it, using the last of his research funds to charter a boat. Discovering the meteorite on one of the islands at the bottom of a dormant volcano, Birely realized that he might use it to take revenge on the world that had rejected him. (Official Handbook of Marvel Universe Deluxe Edition#3: Dr. Demonicus) - Birely acquired funds from some as yet unidentified source in Japan and set up a laboratory in the Aleutian islands. (Godzilla#5 (fb) - BTS) - Taking a cue from the legendary Godzilla, Birely began subjecting the tissues of various lifeforms to the radiation of the meteorite. He then extracted hormones from the mutated tissues, injected them back into the lifeforms, and exposed the hormone-treated organisms to the meteorite. The organisms mutated, becoming monsters: Batragon was his first creation, followed by Centipor, Ghilaron, and Lepirax. (Official Handbook of Marvel Universe Deluxe Edition#3: Dr. Demonicus / Avengers West Coast#73 (fb) - BTS) - Demonicus designed a suit to inhibit the effects of the cancer, eventually sending it into remission. (Godzilla#5 (fb) - BTS) - Birely realized that his creations were limited by the need for regular contact with the meteorite--which he named the Lifestone--to survive. Nonetheless inspired by his success, Birely renamed himself Dr. Demonicus and gathered together society's other rejects (criminals, mercenaries, and derelicts) to form his army of Demon-Soldiers. His army allowed him to seize the island from its rightful owners, the Inuits, and put them to work on the construction of a transport craft composed entirely of meteorite ore. Using this craft as a portable Lifestone, Demonicus intended to rove the entire world with his creations, conquering, pillaging, and taking revenge. (Godzilla#4 (fb) - BTS) - Worked to exhaustion and poisoned by the radiation, many of the Inuits began to starve and grow sick, but Demonicus and his Demon-Soldiers refused to allow them to rest. (Avengers West Coast#72 (fb) - BTS) - Preparing contingency plans, Demonicus secreted a few shards of the Lifestone to other places. (Godzilla#4 (fb) - BTS) - Dr. Demonicus sent Batragon to incapacitate a Liberian oil tanker so that his men could come in and claim the oil for him. (Godzilla#4) - Batragon attacked the tanker, tearing it open and spilling half the oil, and was attacked and wounded by Godzilla. As Batragon returned to the Lifestone, Demonicus recognized his injuries and wondered what could have caused them. He met with the spokesman of the Inuits, commanding them to continue work or he would turn his creations on them. Soon after Godzilla arrived, following the trail of Batragon, who forced through Demonicus' force field to attack Godzilla, only to meet death at his hands. S.H.I.E.L.D. arrived soon after, mistakenly seeing Godzilla as the attacker and assaulted him, and Demonicus allowed them to fight, intending to release his other monsters to defeat the exhausted victor. (Godzilla#5) - When S.H.I.E.L.D. discovered the other monsters and began to buzz the base, Demonicus unleashed Centipor, Ghilaron, and Lepirax against them. S.H.I.E.L.D. agent Gabe Jones made it inside Demonicus' complex, but he fell from the ceiling, and Demonicus was able to hold him at gunpoint. Demonicus vainly shared his origins while the Inuits joined the other S.H.I.E.L.D. agents in attacking the Demon-Soldiers, and Jones attacked Demonicus when he was distracted by the death of Centipor. Godzilla eventually slew Ghilaron and Lepirax, Jones defeated Demonicus, and S.H.I.E.L.D. and the Inuits finished off the Demon-Soldiers. Demonicus was taken into S.H.I.E.L.D. custody. (Avengers West Coast#70 (fb) - BTS / Avengers West Coast#72 (fb)) - S.H.I.E.L.D. bombed the Lifestone into smithereens. (Official Handbook of Marvel Universe Deluxe Edition#3: Dr. Demonicus / Shogun Warriors#13 (fb) - BTS) - The Myndai Maur-Konn supplied Demonicus with an immense satellite, roughly one third the size of the moon, and he maintained it in synchronous orbit on the moon's dark side to avoid detection by anyone on Earth. (Shogun Warriors#13 (fb) - BTS / Shogun Warriors I#20 (fb) - BTS / Official Handbook of the Marvel Universe Deluxe Edition#3: Dr. Demonicus) - Dr. Demonicus created Cerberus, the Hand of Five, and the Starchild via combinations of genetic manipulation and robotics (from Maur-Konn's designs), further mutating them with cosmic radiation from his own space station beyond Earth's moon. (Shogun Warriors#13 (fb) - BTS / Shogun Warriors#14 (fb) - BTS) - Dr. Demonicus decided to claim the Shogun Warriors as his own, killing the human operators and adding the robots to his own creations in a final assault on Earth after it had been weakened by the cataclysm on an immense asteroid impact. His goal was to conquer all of Earth. (Shogun Warriors#7-8 - BTS) - Dr. Demonicus sent Cerberus to Earth off the coast of California, where it battled the Shogun Warrior Raydeen, testing its mettle before escaping and returning to Demonicus' satellite. (Shogun Warriors#8-9 - BTS) - Dr. Demonicus sent Starchild to Earth off the coast of Madagascar, where it battled the Shogun Warrior Dangard Ace, testing its mettle before escaping and returning to Demonicus' satellite. (Shogun Warriors#7-8 - BTS) - Dr. Demonicus sent the Hand of Five to Earth above Tokyo, where it battled the Shogun Warrior Combatra, testing its mettle before escaping and returning to Demonicus' satellite. (Shogun Warriors#11 - BTS) - From his orbiting base, Demonicus used a field of electromagnetic force to direct an immense meteor at Earth, and it was detected by the Followers of Light. (Shogun Warriors#12) - The three Shogun Warriors' pilots, guided by the Followers of Light, flew into space and destroyed the meteor, after which they discovered Demonicus' space station near the moon. Demonicus blasted the three robots as they approached, causing Dangard Ace to crash on the moon, while Combatra and Raydeen were sent careening past the moon. Demonicus' men captured Dangard Ace. (Shogun Warriors#13) - Combatra and Raydeen used an asteroid belt to reverse their course, heading back to Demonicus' base, while Savage blew up one of Dangard Ace's power packs, causing Demonicus' agents to assume the robot to be nonfunctional, breaking free from them when they relaxed their restraints. Dangard Ace destroyed the weapon which had struck them before, allowing the other two to join him inside Demonicus' base. After fighting a batch of giant dinosaur-like mutates/creations ("Dinosoids"), the Warriors entered a chamber containing Cerberus, the Hand of Five, and the Starchild. Demonicus then warned them that he had activated an electromagnetic beam pulling another asteroid at Earth, and that Earth would be destroyed if they couldn't defeat his monsters AND deactivate the device within the hour. (Shogun Warriors#14) - Demonicus was jubilant as Cerberus, the Hand of Five, and the Starchild attacked the Shogun Warriors, who were overcome by doubts about their ability to deal with the multiple threats against both them and Earth. However, Dr. Tambura of the Followers of Light proved able to rouse them out of their funk, causing them to fight back against their attackers. Following his instructions, the three pilots donned cybernetic helmets that linked their three human minds and channeled their very beings into the robots. The combined and coordinated efforts of Dangard Ace and Combatra quickly destroyed Demonicus' creations. The Shoguns destroyed Demonicus' timer device, but Demonicus mocked them, telling them that the meteor had already been sent on a collision course with Earth. In response the Shoguns split his space station in half and launched one of the halves into the approaching asteroid's path, destroying the space station fragment and deflecting the asteroid away from Earth. Combatra then re-entered the other half of the space station and captured Demonicus. The Shoguns brought the rest of the space station back to Earth and turned it over to S.H.I.E.L.D., specifically agents Dugan and Jones. (Official Handbook of Marvel Universe Deluxe Edition#3: Dr. Demonicus) - Turned over to local authorities in California, Demonicus escaped with the help of some of his men. (Iron Man I#193 (fb) - BTS) - Establishing a new, undersea base in the South Pacific, Demonicus managed to enslave his old enemy Godzilla, genetically mutating him as well. (Iron Man I#196 (fb) - BTS) - Demonicus began work on the creation of other creatures, intending to form an army with which he could impose on the world his Pax Demonica. (Iron Man I#193) - Demonicus criticized Godzilla for striking down an Avengers Quinjet piloted by Tigra, not wishing to draw premature attention to his activities. He instructed Godzilla to destroy the Quinjet and its occupant. Tigra was able to send a distress message that summoned two more Quinjets, containing Hawkeye and Mockingbird, and then Iron Man (Tony Stark). Inspecting the destroyed craft, Demonicus realized that its pilot had escaped, so he led Godzilla and some of his men to the nearby fishing village to destroy it, figuring the pilot must be there. As Hawkeye and Mockingbird approached, there ship was knocked from the sky by defense missiles from Demonicus' base. Nonetheless, the heroes recovered, and Mockingbird took out Demonicus' men while the others fought Godzilla. Iron Man flew Godzilla way out to sea, but Demonicus escaped. (Iron Man I#196) - Godzilla retrieved the empty Mark I-type Iron Man armor that Stark had abandoned in the ocean after it ran out of power. Godzilla gave it to Demonicus, who decided to put his other plans on hold in favor of using the armor to gain revenge on Iron Man for defeating him. Meanwhile, an extradimensional energy entity known as the Omnos piloted a set of Mark VII armor in an effort to return it to Jim Rhodes, though it caused some damage and near injury in the process. Reports of the latter rogue armor led Tony Stark to put together a makeshift costume using Iron Man armor components ("Nothing-In-Particular Man"/"Spare Parts Man") to investigate. Demonicus, who had had one of his agents pilot him to California to investigate, trailed Stark towards his current base at Circuits Maximus, only to encounter the Omnos-piloted armor. Mistaking this for the true Iron Man, Demonicus (wearing the Mark I armor) attacked it, but Stark managed to activate the magnetic circuitry in both suits of armor. The two suits locked helplessly back to back and crashed to the ground, where they were unmasked. Demonicus ranted about how they (Nothing-In-Particular Man, plus Jim Rhodes, and Clytemnestra and Morley Erwin) would regret interfering with Dr. Demonicus. (Avengers West Coast#73 (fb) - BTS) - Demonicus' cancer briefly recurred, and his face ended up with a form resembling that of his mask. (Avengers West Coast#72 (fb) - BTS) - After escaping prison, Demonicus retrieved some of his Lifestone fragments. (Avengers West Coast#70 (fb) - BTS) - Demonicus set up base beneath Costa Mesa's Filmland in Wax museum. (Avengers West Coast#73 (fb) - BTS) - Demonicus set up his primary base at the ocean floor in the Pacific, at 33 degrees, 15 minutes North and 166 degrees, 27 minutes West. From there he began operations to drill a hole through the Pacific tectonic plate, allowing volcanic magma to break through, shooting upwards towards the surface and forming an island that he could claim as his own nation: Demonica. (Avengers West Coast#73 (fb) - BTS) - Demonicus set up contracts with Australia's Everard Electronics and Tokyo's Hasanuma Electronics to construct an advanced apparatus built to his specifications. For months the device ultra-sonically cut through the Earth's crust beneath his base. (Avengers West Coast#72 (fb)) - Demonicus concentrated the radiation from the Lifestones on humans. His first subject, a "weakling loser," became Jawbreaker. (Avengers West Coast#72 (fb) - BTS) - Other subjects followed, and Demonicus soon assembled an army of agents, his Pacific Overlords--Big One, Cybertooth, Irezumi, Kain, and Kuroko--intended to enable him to conquer the lands of the Pacific Rim. (Avengers West Coast#72 (fb)) - When a yacht near Demonicus' base capsized, his agents captured the young couple and their baby, transforming them into Pele, Taifu, and the Big One. (Avengers West Coast#72 (fb)) - Dr. Demonicus and Kuroko became close, but he refused to share his true appearance even with her. (Avengers West Coast#74 (fb) - BTS) - Dr. Demonicus genetically altered one of his lackeys to be identical to his original form as Douglas Birely, right down to the finger prints. (Avengers West Coast#63 - BTS / Avengers West Coast#70 - BTS) - The newly-empowered Living Lightning and the android Human Torch battled in the skies not far from Demonicus' new base. When Dr. Pym grounded and seemingly destroyed Living Lightning, Demonicus used his own machines to drain off the last bits of energy and siphon it into his base. He re-formed Living Lightning and made him his prisoner. (Avengers West Coast#71 (fb) - BTS) - Dr. Demonicus somehow captured and hypnotized Sunfire into serving in his Pacific Overlords. (Avengers West Coast#69 - BTS) - Jawbreaker and Kuroko successfully retrieved the largest remaining fragment of the Lifestone for Demonicus, despite the interference of the traitorous Taifu, whom they defeated and brought with them. (Avengers West Coast#70) - After a brief encounter with Spider-Woman (Julia Carpenter), Jawbreaker and Kuroko returned Taifu and the Lifestone fragment to Demonicus' Filmland in Wax base. When Jawbreaker's appearance startled one of Demonicus' technicians into dropping a monitoring device, Demonicus had Jawbreaker snap the man's neck. Demonicus was mildly annoyed at the expected betrayal of Taifu, but was elated upon receiving the Lifestone fragment. (Avengers West Coast#70 - BTS) - Demonicus abandoned the Filmland in Wax base, taking all of his agents with him and leaving behind the Big One to deal with anyone who happened upon the base. (Avengers West Coast#71 (fb) - BTS) - Demonicus also left behind some photographs designed to lead investigators onto false trails. (Avengers West Coast#70) - Spider-Woman, however, sought out the Avengers West Coast, who joined her in locating the Overlords' base. They found the base abandoned and were attacked by the Big One, whom they managed to subdue and capture. (Avengers West Coast#71) - Based on Demonicus' photographs, the Avengers split up, checking out a Tokyo manufacturer, the Sydney Opera House in Australia, and Hawaii. Within his ocean floor base, Demonicus complemented Kain on maintaining operations there, promising him an honored place in the bold, new world he was in the process of creating. Sunfire and Pele were sent to Pearl Harbor, Honolulu to assault a recognition ceremony for Namor the Sub-Mariner, but they were defeated with the aid of Hawkeye and Spider-Woman. Pele escaped, but Sunfire was captured, and he recovered from his brainwashing. (Avengers West Coast#72 (fb) - BTS) - Demonicus contracted a group of Yakuza to slay Hasanuma Electronics' Hiroshi Anami. (Avengers West Coast#72) - The Yakuza assaulted Hasanuma Electronics in Tokyo and slew Hiroshi Anami, despite the efforts of Iron Man, Tigra, and the Wasp, though the Yakuza were eventually defeated by them. Demonicus was pleased with this success, but vowed not to make any outside contracts. He shared his origins with the Living Lightning, commanding him to promise to serve him or be destroyed. When Taifu broke free and attacked Demonicus, he also freed the Living Lightning and sought him as an ally, but--to save his own life from Demonicus' lethal implant--Lightning instead incapacitated Taifu and vowed to serve Demonicus. The three Avengers traveled to Kyoto to investigate a piece of equipment that had been left in Demonicus' Wax museum base, and they were confronted by Irezumi. Iron Man and the Wasp were defeated, but a wounded Tigra escaped. Cybertooth and Jawbreaker waited in ambush at Everard Electronics on the outskirts of Sydney as Dr. Pym, the Scarlet Witch, and Wonder Man arrived. (Avengers West Coast#73) - Demonicus discussed his plans with Kain and Living Lightning, and Kuroko informed Living Lightning that Dr. Demonicus could destroy him by deactivating his costume at any minute. The Overlords at Everard defeated the Avengers and took them prisoner, bringing them to Demonicus' undersea base where they were held prisoner in stasis tubes. Demonicus revealed his true appearance and his plots just before his plans reached fruition, and his new island rose to the surface. He christened it Demonica. (Avengers West Coast#74 (fb) - BTS) - Dr. Demonicus somehow restored the Big One to his normal form as the toddler Kenjiro Sasaki. (Avengers West Coast#74 (fb) - BTS) - Dr. Demonicus sent his lookalike to address the United Nations (UN), making a plea for sovereignty in exchange for promises to share the island's vast mineral wealth with all mankind. (Avengers West Coast#74) - The Pacific Overlords raised the flag over Demonica, but when Demonicus gave the order to execute the Scarlet Witch and the rebellious Pele as he had no more stasis tubes to contain them, the Living Lightning stopped them long enough for Hawkeye, Spider-Woman, Sunfire, and the USAgent to arrive. Demonicus sent the Pacific Overlords to battle the Avengers, commanding his technicians to protect his equipment. The Living Lightning eventually turned against Demonicus completely, destroying his deactivator--with which he could have destroyed the Lightning, and the Scarlet Witch shattered the remaining stasis tubes. Demonicus was punched out by the USAgent, but not before he could activate the device that transformed Kain into immense form. 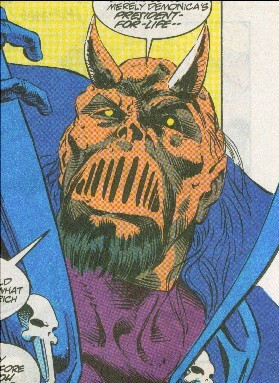 The Avengers eventually managed to stop Kain, but by that point, the Birely lookalike had won the approval of the UN, and Dr. Demonicus was granted sovereignty of Demonica. He promised to return young Kenjiro to Taifu and Pele, who agreed to stay on Demonica. 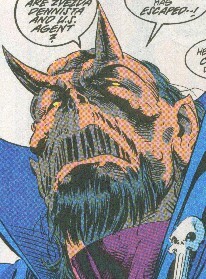 As overlord of Demonica, he commanded the Avengers to leave his island, and they were forced to comply. (Avengers West Coast#93 (fb)) - Demonicus spoke to the UN via teleconference, renewing his promise of sharing Demonica's mineral wealth. (Avengers West Coast#93 (fb)) - Allegedly in search of a place for quiet contemplation, Demonicus entered a newly discovered cave on Demonica. (Avengers West Coast#93 (fb) - BTS / Avengers West Coast#95 (fb) - BTS) - Within the cavern, Demonicus encountered the demon Raksasa, who seduced him with visions of total power. (Avengers West Coast#93 (fb)) - Demoncus emerged from the cave a changed man. He began to push the hired work crews unmercifully, using the Pacific Overlords to rapidly complete Demonica International Airport. (Avengers West Coast#93 (fb) - BTS) - Demonicus insured that some of the early émigrés were of questionable background. (Avengers West Coast#93 (fb) - BTS) - Demonicus placed menta-probes (mind-control devices) on the foreheads of Cybertooth and Jawbreaker. (Avengers West Coast#93 (fb)) - When the United Nations questioned Demonica's recruitment of citizens, Dr. Demonicus renounced his pledge to the UN to share Demonica's minerals. Soon after he sent the Overlords to board a Wakandan ship, freeing its prisoner, Klaw, whom Demonicus named as his vice-president. Kuroko questioned Demonicus' behavior to Kain, after which Demonicus summoned Kain into his cavern and placed a menta-probe on Kain's forehead as well. The invisible Kuroko had followed along, but her surprise over Demonicus' actions caused her to regain visibility. Demonicus sent one of Raksasa's Demonswarm after Kuroko, and she was wounded by it before escaping and fleeing Demonica aboard one of their ships. (Avengers West Coast#93 (fb)) - Demonicus recruited Zvezda Dennitsa to assist his Pacific Overlords. (Avengers West Coast#92 - BTS) - A battered Kuroko confronted the Avengers, telling them that Dr. Demonicus had gone mad and intended to destroy the world. (Avengers West Coast#93) - Demonicus sent Klaw and Zvezda Dennitsa to ambush the Avengers and reclaim Kuroko. They escaped with her back to Demonica. (Avengers West Coast#93 - BTS) - When a plane flew within a couple hundred miles of Demonica, Dr. Demonicus ordered it to turn back. When they refused, he sent Kain and Cybertooth to claim the plane. (Avengers West Coast#93) - Kain and Cybertooth took control of the plane and guided it back towards Demonica. (Avengers West Coast#94 (fb) - BTS) - Demonicus applied a menta-probe to Kuroko. (Avengers West Coast#94) - Demonicus had the Pacific Overlords claim the plane and its crew when it arrived on Demonica. He then issued an ultimatum over world-wide television, establishing a no-fly zone for 500 miles in all directions around Demonica. The UN asked the Avengers to act as a delegation to Demonica, and so Goliath (Clint Barton), Scarlet Witch, Spider-Woman, USAagent, War Machine (Jim Rhodes), and Darkhawk (made a reservist for the purpose of this mission) headed to Demonica. Dr. Demonicus sent the Demonswarm to assault them as they approached, but ultimately allowed them to land. He showed them that Kuroko was now under his control and announced that Demonica was now a theocracy dedicated to the worship of the demon Raksasa. He then commanded the Avengers to leave or face incarceration. The Avengers fought the Pacific Overlords rather than flee voluntarily, but Demonicus had his soldiers threaten the passengers and crew of Zeta Airlines Flight #223, and the Avengers agreed to leave. Demonicus further demanded that two of the Avengers, Mockingbird (H'rpra) and USAgent stay behind as his hostages, and the Avengers agreed to this as well, though not without fierce argument from Goliath. Demonicus then led the Overlords and his prisoners into the cavern where he revealed Raksasa to them. Demonicus agreed to Raksasa's instructions, and the Demonswarm was sent to assault the Hawaiian isles, after which Mockingbird and the USAgent broke free. When Raksasa criticized him for not having already killed them, Demonicus promised they would not leave the caverns alive. (Avengers West Coast#95) - The Overlords recaptured Mockingbird, but USAgent escaped, and Zvezda Dennitsa pursued him, only to propose an alliance against Demonicus' mad plans upon catching up to him. The Avengers fought the Demonswarm as it approached the Hawaiian isles, and Zvezda Dennitsa returned to Demonicus, claiming to have destroyed the USAgent. She spoke to Klaw, attempting to convince him to turn against Demonicus as well, but the USagent attacked the Overlords prematurely. Klaw nonetheless joined the USAgent and Zvezda Dennitsa against the other Overlords, while Demonicus again summoned Raksasa. However, the cavern temple collapsed under assault from Klaw's sonic weapon before Raksasa could cross over the threshold to Earth. The sonic assault had undermined Demonica itself, causing massive earthquakes that culminated in the destruction of the entire island. The menta-probe fell from Kuroko, who vowed to stand beside Demonicus, having always loved him. Demonicus came to his senses and realized his mistake in following Raksasa. He begged his Overlords to forgive him as the cavern collapsed around them. (New Avengers I#4 (fb) - BTS) - Demonicus survived the destruction of Demonica and was incarcerated in the Raft maximum security prison. (New Avengers I#1-3 - BTS /New Avengers I#4 (fb) - BTS) - Dr. Demonicus was among the Raft inmates who escaped--despite the efforts of the soon-to-be New Avengers (Cage, Captain America, Iron Man, Spider-Man, Spider-Woman (Jessica Drew))--during the breakout precipitated by Electro. (New Avengers I#35) - Dr. Demonicus was one of a large number of super-villains who met with the Hood, hearing and apparently accepting his position as the new Kingpin of super-villain crime. For his attendance, he was given $25,000. (New Avengers Annual#2) - Dr. Demonicus was part of the Hood's super-villain army that ambushed the "New" Avengers' base at Dr. Strange's Sanctum Sanctorum. He was incapacitated by the Zom-powered Dr. Strange and then taken into custody by SHIELD. (New Avengers I#46 (fb) - BTS) - Dr. Demonicus was apparently freed by the Hood. (New Avengers#46) - Dr. Demonicus was present along with the rest of the Hood's army when they tortured a SHIELD agent who proved to be a Skrull. Guided by Demonicus, the Hood used his demonic powers to determine that a skrull was impersonating the Slug, and he shot and killed the imposter. (Dark Reign Files) - Quasimodo researched Dr. Demonicus for Norman Osborn. (New Avengers I#50/New Avengers I#55 (fb)) - When Cage's Avengers tried to lure Osborn's Avengers into a trap at an old Hellfire Club base, Osborn instead contacted the Hood who led his super-villain army to assault Cage's Avengers (Cage, Captain America/James Barnes, Ms. Marvel/Carol Danvers, Ronin/Clint Barton, Spider-Man, Spider-Woman/Jessica Drew, Wolverine/Logan/James Howlett). Dr. Demonicus joined the Hood, Answer, Blackout, Blood Brother, Brother(s) Grimm, Centurius, Chemistro, Corruptor, Crossfire, Cutthroat, [Dormammu], Griffin, Jigsaw, Living Laser, Madame Masque, Mandrill, Razor-Fist, Scarecrow, Shockwave, Slug, Vermin, Wizard, the Wrecking Crew in this assault. Ms. Marvel channeled Spider-Woman's power to stun the criminals and allow the Avengers to escape. (New Avengers I#55 (fb)) - The Hood and his motley army recovered, his army unhappy with the Hood's leadership. (Dark Reign: The Cabal#1/3) - Dr. Demonicus was at the funeral where the Hood delivered a short eulogy that acted more like a warning to members of his army. (Dark Reign: The Hood#1) - The Hood put Chemistro, Centurius, Demonicus, the Answer, and Living Laser on a special project. He promised to be in touch soon. (Dark Reign: The Hood#2) - Dr. Demonicus hung out at one of the Hood's safe houses to party. (New Avengers I#56) - When the Hood's powers failed, his army revolted, under the leadership of Jonas Harrow, who used a device to cancel out the powers of the New Avengers (Ronin, Mockingbird, Captain America, Wolverine, Spider-Man, Spider-Woman, Ms. Marvel, Luke Cage) and Osborn's Avengers (Iron Patriot, Ms. Marvel, Spider-Man, Wolverine, Ares, Sentry, Hawkeye), Members of the Hood's army gathered to make their demands, including Crossfire, Cutthroat, the Brothers Grimm, Mr. Hyde, Mandrill, Razor-Fist, Armadillo, Scarecrow, Bulldozer, Piledriver, Wrecker, Thunderball, Chemistro, and Dr. Demonicus. (New Avengers I#57) - Dr. Demonicus watched Osborn agree to Harrow's terms. The power dampener switched off, allowing the New Avengers to escape via a Quinjet that blasted the assembled army of villains. Comments: Created by Doug Moench, Tom Sutton, and Tony DeZuniga. BTW - The Marvel Chronology Project lists Dr. Demonicus as appearing in Dr. Strange II#56. It's not Dr. Demonicus, but rather Demonicus (see clarifications). Valerio Pastore (Wolfhead) noted that in the Shogun Warriors, Dr. Demonicus named his creations after the names given to each of them by the Shogun that first fought that monster. Or it was just coincidence! That little tidbit was revealed in one panel on the last page of the last issue of SHOGUN WARRIORS. Richard Carson asked Maur-Konn, "And you were behind Dr. Demonicus, weren't you? - - Helped him escape prison, supplied him with that space station..." and Maur-Konn replied, "Yes, but the fool failed - - forcing me to take matters into my own hands!" That was it. This was clearly a last-minute attempt to avoid leaving any loose ends lying around since the series was cancelled. Unfortunately, it's not a perfect solution since Maur-Konn was almost certainly not the person who was originally intended to be the silent partner of Demonicus (but I have NO idea who that person was going to be). The main problem comes from the timing. When the Shogun Warriors defeated Maur-Konn in SW #6, their pilots were told that their mission was completed and they could now go home and SW #7 showed them doing just that. 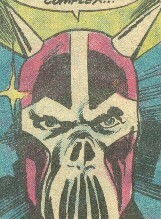 However, SW #7 also featured the first appearance of Cerberus "so soon after the defeat of Maur-Konn." Since the creation of the space station and the various monsters used by Demonicus must have taken some time, the only way that Maur-Konn could be responsible was if he got involved with Demonicus sometime between his first two encounters with the Shogun Warriors (i.e. between the Rok-Korr issues [1-3] and the Mech-Monster issues [4-6]). That seems to be rather a tight squeeze but, in the absence of any better answer, I guess it's one that we have to accept as canon. I would hazard to guess that it was originally going to be Noah "Centurious" Black. But, that this idea was nixed, by the senior Bullpenners @ Marvel, as this character was probably already being used for the Bloodstone Conspiracy.